Chester City: MacKenzie, Regan (Edmondson 45), Bolland, Hope, Nicholas, Drummond, Carden, Davies, Lowe (Sestanovich 85), Foy, Branch. Subs not used: M.Brown, O’Neill, Hessey. Bury: Garner, Scott, Challinor, Barry-Murphy, Shakes (Boshell 65), Flitcroft, Whaley, Mattis, Kennedy, Porter, Kazim Richards. Subs not used: Collinge, Buchanan, Barrow, Cartledge. It was very thoughtful of Blues hero Graham Barrow to present us with an Easter gift of three much-needed points on his return to Chester. New signing Ryan Lowe actually sealed the points by scoring a brace of goals – but even the most blinkered Blues fan had to admit it was not a well-deserved victory. City started with virtually the same team which earned a draw at Mansfield, with the one exception of Carl Regan replacing Darren Edmondson. Once we’d got the formalities over with in the shape of a rousing welcome for Barrow, now the Bury manager, as well as his sidekick Joe Hinningan, now Shakers’ physio, it was a decidedly slow start to the match. There was no real action until the ninth minute when Bury won a free kick on the edge of the area. As ex-City midfielder David Flitcroft shaped up to take it, I heard people mutter – “Don't worry he never scored a free kick for us”. And in a slick training ground move (or as a result of very poor City defending), rather than aiming for goal, the ball was passed to an unmarked Bury player. He crossed the ball, but the resultant shot went wide. A minute or so later, the orange-booted Colin Kazim-Richards found himself in space and took a shot at goal. Chris MacKenzie tipped the ball around the post and Bury won a corner. Thankfully this was wasted when the ball went over everyone’s head and straight out of play for a goal kick. Just as the Chester fans were breathing a sigh of relief, MacKenzie’s goal kick landed right on the feet of Mr Day-Glo boots and he skilfully volleyed the ball straight back. The City ‘keeper was still off his line and the ball went in the net in front of the aghast home fans. MacKenzie’s blunder must rank as one of the all-time goal-keeping clangers I’ve seen at Deva Stadium. Kazim-Richards was actually a thorn in Chester’s side for the rest of the first half and he was clearly running Regan ragged. Chester simply didn’t threaten on goal at all in the first 45 minutes, apart from a couple of offsides, and looked disjointed in every area. They were rightly booed off the park by a significant section of the home crowd. Regan was unsurprisingly replaced by Edmondson for the second half, but the action had barely started when play was halted for an accidental clash of heads between Michael Branch and Brian Barry-Murphy. Branch looked like he came off the worst, but staggered off the pitch and after close inspection by two doctors was allowed to continue. We later discovered that Barry-Murphy was the one who really suffered, as he lost part of his ear when the two collided. Chester made a much brighter start to the second half and their industry was rewarded when Ryan Lowe, who hadn’t contributed too much at that stage, beat his marker and shot along the ground from about 25 yards out. Bury ‘keeper Glyn Garner seemed to have misjudged it, and the Blues went wild at Lowe’s debut goal. Soon after Barrow took off Bury’s influential, and aptly-named, Ricky Shakes, replacing him with Oldham loanee Danny Boshell. But before long, Bury were punished by Lowe again. His 70th minute strike must have been one of the easiest goals he’ll ever score – a six yard tap-in when he was unmarked. There followed a very edgy end to the game, as we knew there would be a long stoppage time (in the end it was five minutes) because of the Branch and Barry-Murphy injuries. Ian Rush took Lowe off on the 84th minute, to a standing ovation from the main stand. Soon afterwards he was rightly named as man-of-the-match. Lowe was replaced by Ashley Sestanovich, but he didn’t really make any impact in the closing minutes. There were a couple of bookings as the game drew to a close – one for either side. 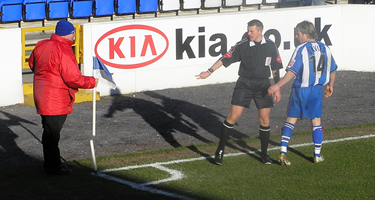 Premiership referee Matt Messias was actually one of the better officials I’ve seen at the Deva – I hope he visits again. When Mr Messias blew the final whistle there was a real sense of relief from the Chester fans as we moved closer to ensuring League Two survival. Thanks for the three points, Graham – I always said you were a generous man! Booked: Lowe, Hope, Edmondson, Drummond. Mansfield Town: Pilkington, McNiven, Baptiste, Buxton, Neil, Rundle (Dimech 82), McLachlan, Coke, Lloyd, Brown, Barker. Subs: White, McIntosh, Day, Barrowman. Chester City: MacKenzie, Edmondson (Regan 54), Bolland, Hope, Nicholas, Drummond, Carden, Davies, Lowe, Branch, Foy. Subs: Hessey, O’Neil, Sestanovich, M.Brown. It was time to renew acquintances with yet another old friend and remind ourselves that we’d far rather be playing Mansfield Town than Farnborough Town next season. And this was yet another old friend who seemed to have moved house since we last visited. The Field Mill of 2005 is almost unrecognisable from the ground Chester last played at back in 1999. The original main stand bought, rather bizarrely, from the former Hurst Park racecourse in Surrey, is no more. It’s been replaced with an impressive new two-tier stand, flanked by two big all-seater stands behind each goal. All that reminded us of our last visit was the small wooden stand in front of the dugouts, but these days this only seemed to be occupied by the press. Chester’s one-off kit, all-maroon, with sky blue trim – specially made because our first and second kits were deemed to clash with the Stags’ yellow shirts and royal blue shorts – added to the general feeling of unfamiliarity. Ryan Lowe, making his debut for City, also gave the 314 travelling Blues fans another new thing to think about. Lowe, wearing number 10, actually made a promising first appearance. But he wasn’t the only City player to give a reasonable account of themselves, earning the Blues a much-needed away point. The first half wasn’t the most entertaining of duels. Mansfield shaded the possession and Scott McNiven drew an excellent save off Chris MacKenzie, who had to dive to the right-hand corner of his goal to prevent the home team going ahead. The Stags also won several free kicks, but squandered all of them without really threatening MacKenzie again. Mansfield did make a couple of good runs down the left-hand side, with Adam Rundle proving a handful. But the Blues’ defence could just about contain the on-rushing Stags’ midfielders. The closest we got to a goal in the first half came when a close-rangeMansfield strike seemed to be heading straight for goal, only for Phil Bolland to clear it off the line. Chester had couple of shots on target as lively Robbie Foy and Ryan Lowe both stepped up a gear towards the end of the first half. But Stags’ goalkeeper Kevin Pilkington had the measure of a good shot by Foy a few minutes from the interval. Lowe also had a stab just before the break, but his shot when wide of the goal. During the second half break I pondered about correcting the handful of Chester fans who’d been shouting anti-Yorkshire chants at the Mansfield fans. But it wasn’t the worst chant the Stags fans heard that night, so I decided against it. The ‘maroons’ seemed to delay running out for the second half for a good few minutes – was this a ‘mind game’ tactic by Ian Rush? Or were the players enjoying their Yorkshire, er Nottinghamshire, tea too much? But it was Mansfield who made the first impression in the second half when Alex Neil, another tricky player, rode a couple of challenges and ran towards the box. But his shot was a weak one and MacKenzie had no trouble dealing with it. Soon after the Stags were running rampant again – this time from the middle of the park. But Chester captain Paul Carden, who had a solid display on his return from suspension, put in a telling tackle just at the right time. Darren Edmondson, who’d had a so-so performance and was one of four bookings made by the card-happy referee, was replaced by Carl Regan on the 54th minute. Soon after came the fourth booking for Chester, when Stuart Drummond was deemed guilty of dissent and the ball was moved forward 10 yards ready for the Stags to have yet another wasted free kick. Chester started looking brighter and soon had the best scoring chance of the night when Lowe found himself in a one-on-one with Pilkington. His shot span under the ‘keeper and was trickling agonisingly towards the line in front of the away fans, when Pilkington scrambled back and grabbed it before it could cross the line. It was a much more entertaining second half, and Chester had another crack at goal when Michael Branch, who looked lively all evening, laid on a well-timed pass to Carden. But his shot went wide. By now the Stags also had two bookings to their name, and they were beginning to look tired. Carlton Palmer replaced Rundle with long-haired, Maltese-born, Luke Dimech on the 82nd minute. Mansfield were looking happy for a point at this stage. Chester won a corner near the end, which found Drummond’s head, but Pilkington had no trouble making a save. Mansfield also had a corner at the death, but MacKenzie also had no problem dealing with it. The City nerves were jangling during the couple of minutes of added time, but both sides settled for a draw. It was good to see so many Chester players give the travelling fans a long round of applause after the final whistle. If the team continue to play with the same spirit, we should see a few more rounds of applause this season. Chester City: MacKenzie, Edmondson, Hope, Bolland, Nicholas, Davies, Drummond, Sestanovich (Booth 88), M.Brown, Foy (O’Neil 88), Branch. Subs: W.Brown, Regan, Hessey. Notts County: Elliot, Friars, Wilson, Ullathorne, Pipe, McFaul (Zadkovich 71), Oakes, Gill, Bolland (Harrad 66), Stallard, Hurst. Subs: Dryden, Scully, Williams. City eased their relegation fears slightly with this much needed win over Notts County at Deva Stadium. Manager Ian Rush made changes from the side that lost at Wycombe last Saturday. 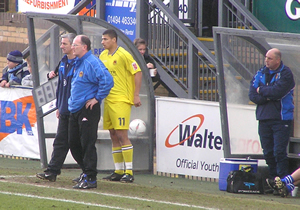 Goalkeeper Chris MacKenzie replaced Wayne Brown who dropped to the bench. Ashley Sestanovich came in for the suspended Paul Carden and on-loan defender Andy Nicholas replaced Sean Hessey. The Magpies had the better of the opening exchanges. Matthew Gill tested MacKenzie from outside the box in the first minute, while Stefan Oakes shot over from a similar position soon after. It was Sestanovich who registered City’s first effort on goal but his 25-yarder was caught by youngster Robert Elliot in the visitors goal. On the quarter hour mark Stewart Drummond connected with a Ben Davies corner only to see his header from close range flash wide. Midway through the half the Magpies opened the scoring as Glynn Hurst latched onto a flick header from Mark Stannard after the City defence had failed to clear a long throw-in. City needed a quick response and the got it just five minutes later, Drummond took advantage of poor defending to score from 18 yards after the County defence had failed to clear Robbie Foy’s cross. Davies fired over and Drummond saw a header hit the woodwork before the sides finished level at the break. Michael Branch showed a taste of what was to come soon after the re-start after being set-up by the hard working Foy he saw a goalbound shot blocked by Gill. Branch shot over following another Foy cross before the striker found the net following a delightful Davies through ball to put City 2-1 up. Twenty minutes later the duo combined for City’s third as Branch latched onto Davies’s pass to stroke the ball under the advancing Elliot. Just four minutes later, MacKenzine made a superb save to deny Notts substitute Ruben Zadkovich, pushing the ball round the post for a corner. But the striker wasn’t to be denied a goal as he converted from the resultant flag kick. Wycombe Wanderers: Talia, Senda, Johnson, Nethercott, Easton, Uhlenbeek, Ryan (Williamson 74), Burnell (Claridge 65), Bloomfield (Dixon 77), Tyson, Stonebridge. Subs not used: Williams, Perpetuini. Chester City: W.Brown, Edmondson, Bolland, Hope, Hessey, Vaughan, Drummond, Davies, M.Brown (Sestanovich 61), Foy, Branch. Subs not used: MacKenzie, Walsh, O’Neill, Booth. The first time Chester visited the Causeway Stadium back in 1993, it was a carnival atmosphere as Wycombe celebrated their first home game in the Football League. And come the end of the season, both teams had something to celebrate when they won promotion from the basement division. There was also a ‘fun day’ mood as the Chairboys offered free tickets and pre-match entertainment, attracting more than 8,000 fans to their impressive ground. But the odds must now be growing that the clubs will start next season in different divisions – possibly even two leagues apart. Wycombe killed this game off inside eight minutes with three second half goals against a hapless Chester side which seemed incapable of an effective reply. The final agony for the 430 travelling Blues fans came with the news that other results had gone against them – leaving City just six points above the drop zone. The Chairboys had dominated the match’s opening exchanges, winning a couple of corners soon after kick-off. The City defence had no trouble dealing with them, but Wycombe looked threatening almost from the off, with a couple of shots in the first 10 minutes. 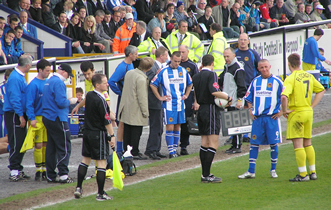 Chester were without suspended captain Paul Carden, with Stephen Vaughan Junior a poor substitute for him. He can’t be criticised for effort – but spent most of the game running round and round in circles. When he did get the ball, he usually took the easiest option with a six-yard pass back. Wycombe’s Danny Senda and Nathan Tyson were both exceptionally fleet-footed and regularly had the beating of the likes of Vaughan, Sean Hessey and Darren Edmondson. Chester’s on-loan Robbie Foy did niggle at the Wycombe defence, combining well with Michael Branch on a couple of occasions in the first half. Foy’s persistence on the right-hand side led to Chester taking the lead against the run of play. He was snapping at the heels of the Wycombe defence when the ball fell well for Branch. He took the ball well, slamming it home past Wycombe’s well-travelled ‘keeper, Frank Talia. But there was still a long 65 minutes to go, and just when it looked like Chester might sneak into the half-time dressing room with a 1-0 lead, Wycombe came back with a goal. Chester ‘keeper Wayne Brown had just made an excellent close-range reflex save on the 41st minute after a game of ‘pinball football’ in the box. But that strike seem to leave the Blues’ defence rocking, and within a few seconds Wycombe dangerman Tyson had an easy opportunity to equalise from afew yards out following a throw-in. He made no mistake and once again, the Blues had lost a lead. Before the half-time whistle went, there was chance of City going further behind as a Phil Bolland clearance hit the crossbar. 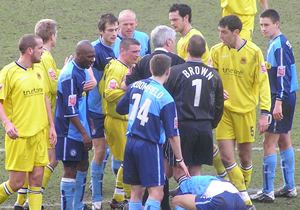 Bolland then got involved in a tangle with Tyson, which saw a booking for the City centre-half. Ian Rush made no apparent change of tactics for the second half and before long the match was over. Wycombe signalled their intent straight after the re-start when they hit the woodwork. And within a few minutes Tyson got the ball in the net for the second time. There was a glimmer of light for the Blues when referee Mike Warren, a silver-haired 1998 World Cup final linesman dubbed ‘Father Ted’ by one Chester wag, booked Wycombe’s Ian Stonebridge for diving in the area in a bid to gain a penalty. 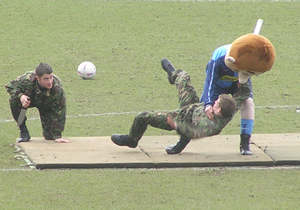 But Stonebridge soon had his revenge when he had his part in Wycombe’s third goal – passing to Gus Uhlenbeek in the box. It was now 3-1 and Chester still seemed incapable of changing their game plan. So it was no surprise when the Chairboys went 4-1 up when the City defence were still napping. Dozens of City fans responded by heading for the exit and chants of ‘Rush out’ could be heard. The Chester manager responded by substituting Michael Brown, who’d had one of his quieter games, for Ashley Sestanovich on the 70th minute. He made his presence felt and seemed to have a reasonable touch, but there was no chance of City scoring three goals in the last 20 minutes. There was a minor consolation for the City supporters when Uhlenbeek handballed in the box and the ref awarded an 86th minute penalty. Foy and Branch argued over who should take the spot-kick. Branch won the argument and scored with a confident strike. But Wycombe nearly made it five when Steve Claridge, introduced as a 64th minute sub, found himself in a one-on-one with Brown. But the City ‘keeper made an impressive save to keep the goals tally at a less embarrassing score and the final whistle blew a few minutes later. When Chester came to Wycombe back in 1993, they bought more than 1,100 fans with them. If City continue to play so poorly, I wonder when we’ll next see that number at an away fixture? I know I’m not the only Blues fan who said the highlight of the day was our visit to the excellent town centre Bell pub. Unless changes are made, there’s bound to be more and more City fans staying in the pub all afternoon – the alternative is looking grimmer and grimmer. Chester City: W.Brown, Edmondson, Bolland, Hope, Hessey, Drummond, Carden, Davies, Walsh, Foy, Branch. Subs not used: Belle, Vaughan, O’Neill, Booth, Whalley. Southend United: Flahavan, Hunt, Prior, Barrett, Wilson, Pettefer (Bramble 73), Maher, Bentley, Gower (Nicolau 90), Eastwood, Gray. Subs not used: Jupp, Kightly, Holloway. After a week of turmoil – one of Chester’s better performances. City played with great spirit especially in the second half and their hard work looked as though it might yield them three points only for Southend to equalise five minutes before the end of normal time. A bitter wind brought with it a torrential shower at kick off and made playing conditions extremely difficult. The pattern of play was not pretty but Chester, with the wind at their backs, took the game to their high-flying opponents. City gained an early lead when Bolland’s pass after a stumble led to Branch bursting through and firing a shot at the keeper. Walsh drove the rebound into the back of the net. Southend rarely threatened to reply but a goal arrived from a direct free kick on the edge of the box after Hope had been harshly adjudged to have fouled a forward following some hesitation in the City defence. 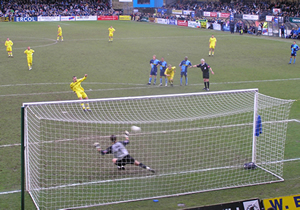 Gower, a former opponent of City with Barnet in the Conference, hit a dipping shot, masked by two Southend players in front of the City wall. Brown could not reach it before it found the bottom corner of the net. It was anticipated that the visitors would consolidate and push for a winner to help their promotion campaign but it was City, spurred on by the excellent Davies and Carden who began to gain the upper hand. Foy and Branch added pace to City’s attacks and it was the latter who cleverly latched on to a through ball and got behind the defence to lay the ball on a plate for Davies to score. Ben was so exuberant in his celebrations that he kicked the corner flag no doubt expecting it to bounce back upright again. Instead it shattered into several pieces and the game was delayed for a few minutes until a substitute was found. City had the chances to extend the lead, the most notable falling to Branch but his shot, hit with the outside of the boot went wide. Even after Southend’s fortunate equaliser when a wayward shot took a wicked deflection to beat Brown, City might have snatched a deserved winner in the five minutes of added time. A respectable point against the team who rose to third in the league after this result could easily have been three. It was a much improved display and the crowd, who got behind the team all afternoon, applauded City off the park.